There are many commonly used experiments included in the new VeSyMA – Suspensions library ranging from the simple mass check experiment to slalom and double lane change manoeuvres. These common tests are very useful in setting up and testing vehicle performance for every day driving situations and common road vehicle tests. But there are some unusual situations that would be fun to simulate, such as working out how much you would need to modify your vehicle to be able to jump a blocked road ahead. A slightly uncommon situation, but a very important one to get right. Thankfully it is only a 50m jump and, even better, that there is an entrance ramp and catch ramp; and given the angle of the entrance ramp, you would need to be driving at 67 mph to have enough distance to clear cars blocking your path to land on the catch ramp. But knowing the correct speed is not very useful if your car will fly correctly and land on its roof or nose. Therefore, getting the weight distribution, correct suspension and aerodynamics to make sure that you land on the catch ramp at the right pitch angle is very important. The example small family car in the VeSyMA – Suspensions library happens to be a good starting point for the simulation, with multibody suspension, Pacejka tyre models and an ideal powertrain. The road building functions also allow the road to be created using only x, y and z position data and the target speed. The closed loop drivers will control the accelerator, brake and steering to follow the road. The only modifications in the first test are to the powertrain, to change the driveline model from front wheel drive to rear wheel drive, and to add bump stops in the suspension. 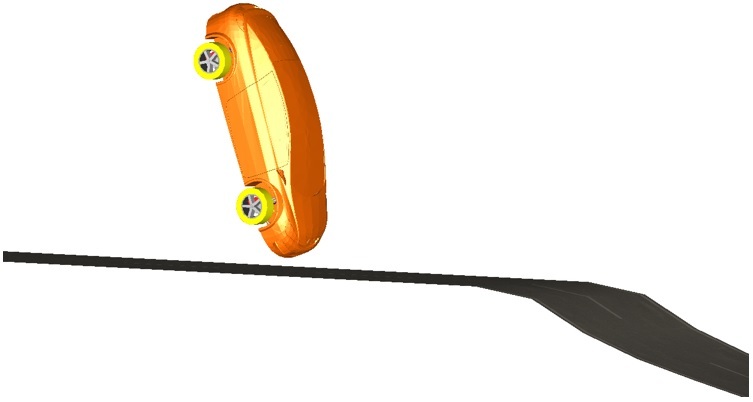 Unfortunately with the mass and aerodynamics in the default position the vehicle would land awkwardly, as shown below, with the nose pitching forward and as a result, hitting the ground before the catch ramp. With a little modification to the centre of mass in the body model and a few tests you find that correcting the location by moving it rearwards by 0.5m causes the vehicle to land properly. This change is done as the vehicle is now rear wheel drive, with the rear differential, driveshaft and stub axles moving the mass from the front to the rear of the vehicle. Using a mass check experiment from the library, and the total mass function you find that that equates to only needing to move the centre of mass for the full vehicle back to 1.42m behind the front axle, as opposed to 1.09m. The Aerodynamics would also need to be altered by reducing the amount of drag on the vehicle and raising and moving back the centre of pressure to slow the forward pitch. Finally, the driver chosen to run the test was a closed loop test driver that was to apply no brake or accelerator and to apply the clutch when leaving the ground but would still steer to be able to control the yaw when landing. To improve stability, the driver model needed slight alteration to handle the higher speed, therefore the gain controlling the effect of the heading angle error was reduced slightly. The result can be seen below, with the vehicle clearing the blocked road and landing correctly on the other side. The road model was built using the Suspensions Road building function and the driver has a single lateral controller modification to improve high speed stability. Please get in touch if you have any questions or have got a topic in mind that you would like us to write about. You can submit your questions / topics via: Tech Blog Questions / Topic Suggestion. Can An F1 Car Drive On The Ceiling? Virtual development and testing of autonomous vehicles – where to start? How can I make my models run faster? Got a question? Just fill in this form and send it to us and we'll get back to you shortly.